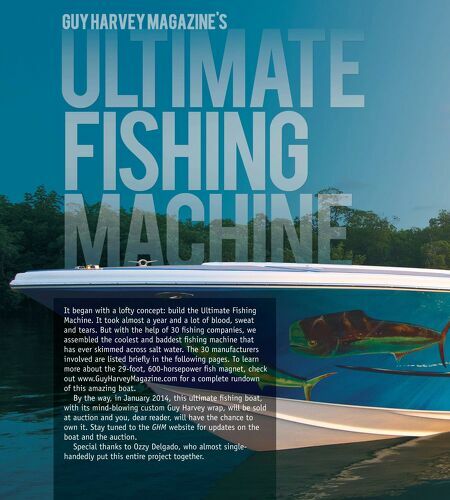 It began with a lofty concept: build the Ultimate Fishing Machine. It took almost a year and a lot of blood, sweat and tears. But with the help of 30 fshing companies, we assembled the coolest and baddest fshing machine that has ever skimmed across salt water. The 30 manufacturers involved are listed briefy in the following pages. To learn more about the 29-foot, 600-horsepower fsh magnet, check out www.GuyHarveyMagazine.com for a complete rundown of this amazing boat. 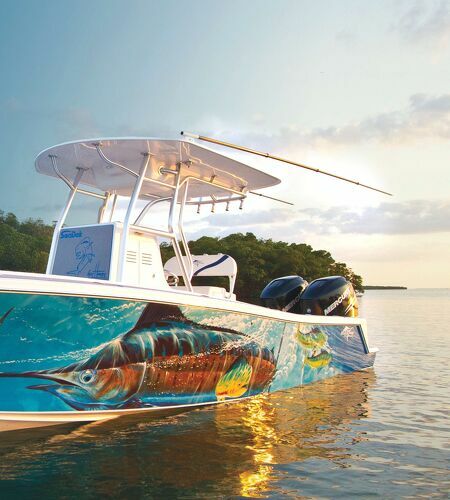 By the way, in January 2014, this ultimate fshing boat, with its mind-blowing custom Guy Harvey wrap, will be sold at auction and you, dear reader, will have the chance to own it. Stay tuned to the GHM website for updates on the boat and the auction. Special thanks to Ozzy Delgado, who almost singlehandedly put this entire project together.